This lock free route takes you along the beautifully tranquil and rural Ashby Canal to its terminus at Snarestone. Take in the site of the Battle of Bosworth, and Heritage Visitor Centre, and the attractive village of Stoke Golding, where Henry V11 was crowned in 1485. From bridge 16 it is a short walk to the local store with a cash point. Hinckley boasts having the first stocking machine in 1640, but visit the 'bleeding' tombstone at St Marys Church, and Great Meeting Chapel (1722) and museum . The old Norman castle has only a bailey and part of the moat remaining. After leaving the battlefield the canal crosses the road using the only aqueduct on the entire canal, the lovely little brick built Shenton Aqueduct. 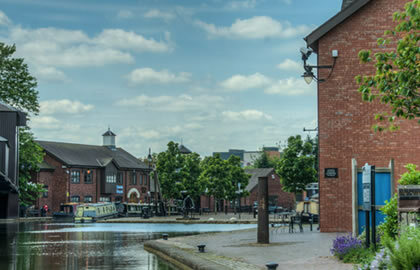 Next along the journey is Market Bosworth to your left which is a good place to stop for the night, a mile walk from the canal takes you to the town centre where there are shops, a café, and several pubs. A market is held every Wednesday. Market Bosworth is a beautiful, well preserved town with many historical buildings and some lovely places to eat, largely clustered around the old cobbled market place, a conservation area.This is the last chance to stock up on supplies till the end of the canal, so make sure to get everything you need before continuing on. Just to the west of bridge 42 is Bosworth water Trust, a large leisure park with a 20 acre lake for water pursuits. Craft & wetsuits for hire. The canal continues to meander through open fields passing Congerstone village to Shackerstone which is the home of the Battlefield Line Railway. There is a tearoom at the station and a wonderful railway museum packed with exhibits and memorabilia from the days of steam. The wooded section beyond Bridge 53 marks the start of Gopsall Park. The hall here was demolished in 1951, however Gopsall Wharf by Bridge 58 was the last site used for loading coal and transporting it to the paper mills along the Grand Union Canal. The Rising Sun Pub is in the village. Snarestone is the home of the Snarestone Tunnel, which is quite short at 228 metres and is only suitable for one way traffic as there is a kink in it, there are moorings at the entrance which are convenient for visiting one of the two pubs in the village, including the Globe Pub which is in the quiet village of Snarestone. The tunnel leaves us with just a half mile cruise to the end of the canal which finishes suddenly in the middle of the countryside. Beyond here work is in progress to restore the northern section of the canal. 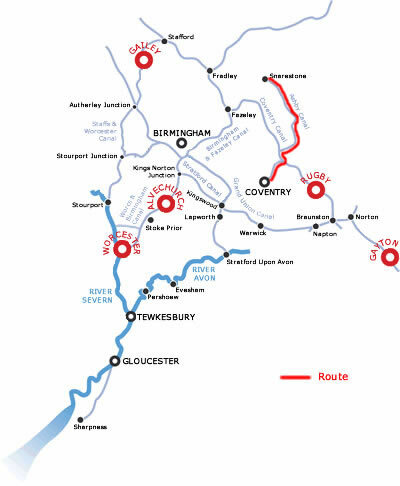 Turn around at the terminus and begin the return journey, stopping at Stoke Golding for your last night, there are good moorings between Bridges 27 and 28 and an attractive canalside picnic area. At bridge 25 there is an excellent farm shop selling home produced meat & vegetables. In Stoke Golding is one of the finest and most beautiful churches in Leicestershire , full of original 13th and 14th century work. There are 2 pubs in the High street. Cruise back to Coventry Basin, where you should spend the night as you need to be back there by 8.30am, so it saves you from getting up too early! !